CCleaner 5.33 ransomware uses sophisticated techniques to infiltrate computers and hide from its victims. Use Reimage to determine whether your system is infected and prevent the loss of your files. 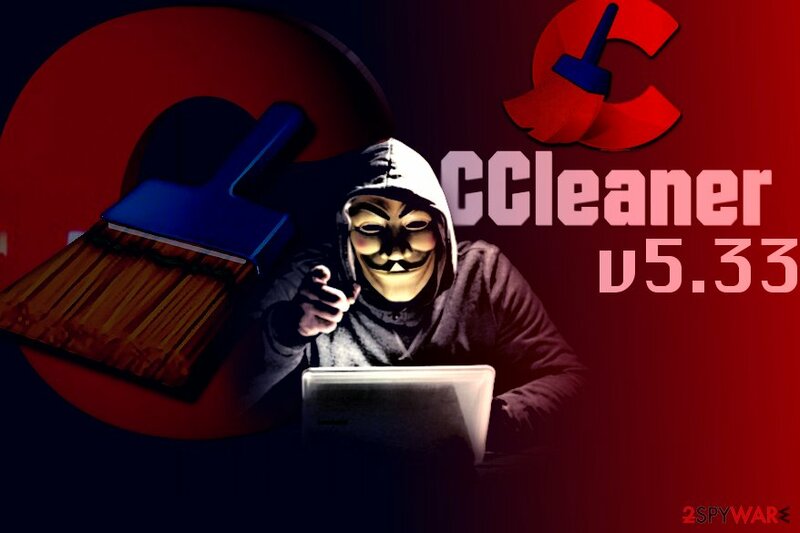 CCleaner virus defines a corrupted v5.3 version of a well-known anti-malware tool CCleaner. By using Advanced Persistent Threat (APT) type of attack, the perpetrators have managed to violate the distribution network and deliver malware in the disguise of a certified CCleaner 5.33 version. The malware, which gained the name of Floxif Trojan, managed to deceive over 2 million users that they had downloaded a validated CCleaner version 5.33 and CCleaner Cloud 1.07.3191. The attack began on August 15 and lasted up to September 15, 2017, when security experts have managed to detect the felony. Update September 28th, 2017. Though Avast who now owns the tool originally created by Piriform, has stated that the malware was terminated, it seems that the cyber criminals continued the assault. The first stage of the CC Cleaner virus attack sparked assumptions that the endpoint target was ordinary users. Floxif trojan which behaves as a backdoor virus was programmed to collect information about victims' and send the data to a remote server. Due to the overload of the server, the database had crashed. It led malware developers to rebuild the database and initiate a second stage of the attack. It then revealed that ordinary users were only an intermediary chain to target major companies: Microsoft, Sony, Samsung, Cisco, VMware, D-Link, Linksys, HTC. A recent analysis revealed over 700 000 devices were infected and approximately 20 companies have been infected with the malware within the span of 4 days. Telecommunication and social network companies are among the most affected targets. The companies in Japan and Taiwan reported having the utmost number of infected computers – 10 and 13 – respectively. Floxif CCleaner Trojan was embedded in the 32-bit version of CCleaner 5.33.6162 and CCleaner Cloud 1.07.3191. The attackers added the malware into the main executable of the software, known as CCleaner.exe. The malicious version was publicly available to download between August 15, 2017, and September 15, 2017. The company that owns the rights to the software reported that approximately 2.27 million people installed and used the compromised version of the PC optimization software. The compromised version installed a backdoor to victim’s computers that was capable of transmitting certain data to C&C server. Infected users should immediately update to 5.34 version of the software and take actions to change passwords and other sensitive data that criminals could have accessed. Two IP addresses – 216.126.225.163 and 216.126.225.148 – are associated with the hackers. Research suggests that updating might not be enough as criminals have included a previously undiscovered payload. Victims are advised to restore their computer from backups to erase the malware entirely. To protect your computer and complete CCleaner virus removal, you must update from v5.33 to v.34 IMMEDIATELY. The impact of the malware is high, however, considering that the software manages to score up to 2 billion downloads per month, the situation could have been worse. Floxif is the name of the malware found in CCleaner 5.33 version. Besides, the compromised version could have brought more malware to your computer (as it reportedly could do so), so we strongly recommend scanning your computer with anti-malware software to remove CCleaner Floxif Trojan remains and other dangerous programs at once. Reimage or Plumbytes Anti-MalwareMalwarebytes Malwarebytes will help you do that faster. The second payload starts with an installer called GeeSetup_x86.dll. Once activated, it determines what is the version of the system – 32 or 64-bit and then drops the trojan on it. The one for 32-bit version is called TSMSISrv.dll, and the other one is EFACli64.dll. It appears that malicious actors sought to steal intellectual property from the listed technology firms. As we specified before, original servers of CCleaner were compromised during the cyber attack, and it means that the malware was available to everyone who downloaded the software from Piriform’s website. The updated version was released on August 15th, 2017, meaning that it was the date when users started to download the compromised version on their computers unknowingly. Zondervirus.nl warns that the same thing could have happened to anyone who installed an update for the PC optimization software between August 15 and September 15 of 2017. Note that Piriform CCleaner program itself is NOT a virus. It is an entirely legitimate software that you can use, however, malicious actors used illegal methods to break into companies’ servers and inject malicious scripts into the signed software. Right when security experts detected C Cleaner virus, Avast issued an official statement urging users and companies update to 5.34 version. However, there is still a lack of information how the perpetrators have managed to continue the assault. In order to ensure that your computer is safe from the malware, uninstall the program, scan the system with Plumbytes Anti-MalwareMalwarebytes Malwarebytes or alternative security tool, and reinstall CCleaner 5.34 version. Now let us discuss options how to remove CCleaner malware. Research suggests that it might not be enough to remove CCleaner virus by updating it to 5.34 version. Since the second payload was discovered, we recommend cleaning your computer fundamentally. Therefore, we recommend you to restore your computer from a backup (created before installation of the malware) and then double-check your PC with anti-malware software. You can find instructions on how to clean your computer below. Once you complete CCleaner removal, protect accounts that you accessed while the malicious version of computer optimization software was running on your PC. We strongly recommend you to change your passwords using a device that wasn’t compromised – ideally, your phone. Log in to your infected account and start the browser. Download Reimage or other legitimate anti-spyware program. Update it before a full system scan and remove malicious files that belong to your ransomware and complete CCleaner 5.33 removal. When a new window shows up, click Next and select your restore point that is prior the infiltration of CCleaner 5.33. After doing that, click Next. Once you restore your system to a previous date, download and scan your computer with Reimage and make sure that CCleaner 5.33 removal is performed successfully. ^ Additional information regarding the recent CCleaner APT security incident. Avast Blog. ^ John Leyden. Downloaded CCleaner lately? Oo, awks... it was stuffed with malware. The Register. Sci/Tech News for the World. ^ CCleaner Cyber-Attack Hit Telecoms, Network Hardware Companies Hardest. eWeek. Technology News, Tech Product Reviews, Research and Enterprise Analysis . ^ Edmund Brumaghin, Earl Carter, Warren Mercer, Matthew Molyett, Matthew Olney, Paul Rascagnere, Craig Williams. CCleaner Command and Control Causes Concern. Cisco's Talos Intelligence Group Blog. A Blog from the World Class Intelligence Group, Talos, Cisco's Intelligence Group. ^ ZonderVirus. ZonderVirus. Malware Removal Guides and Security News. ^ Security Notification for CCleaner v5.33.6162 and CCleaner Cloud v1.07.3191 for 32-bit Windows users. Piriform News. Release Announcements. Was ist der "CCleaner 5.33"-Virus? This entry was posted on 2017-09-28 at 06:40 and is filed under Malware, Viruses. You can quickly scan the QR code with your mobile device and have CCleaner 5.33 virus manual removal instructions right in your pocket. How did you remove CCleaner 5.33 virus?